When making Cobb Salad, I dare you not to a) prepare extras and extras of toppings, and b) not eat said toppings before it’s time to assemble your salad. Case in point, anytime I make something that calls for bacon, or chicken, or really any protein, I have a hard time not doubling it. See, bacon and chicken just freezes SO well. 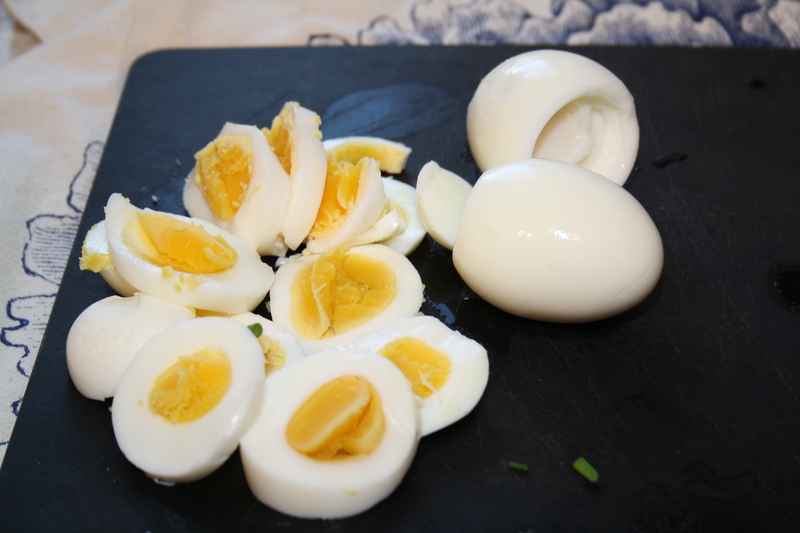 It’s brilliant to pull it out of the freezer in a hurry. And I dislike bacon-cooking so much, I’d rather do it once for an entire package. 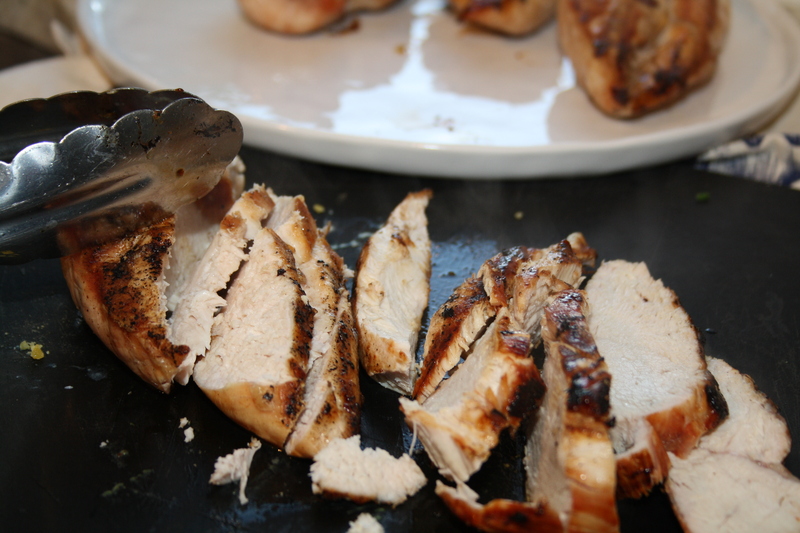 So you’ll see from the photos, I had a hard time not overboarding on the bacon/chicken/(ok, avocado too) amounts. 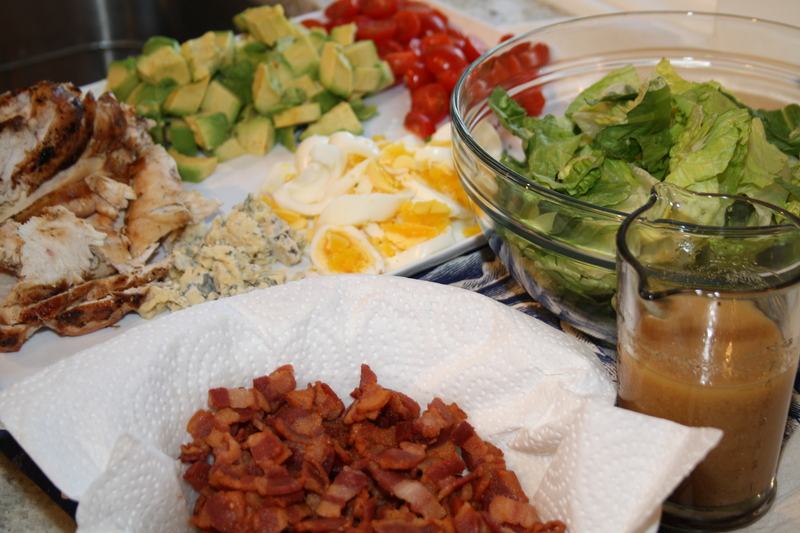 Cobb Salad is a wonderful thing. You’ll likely have most ingredients already. 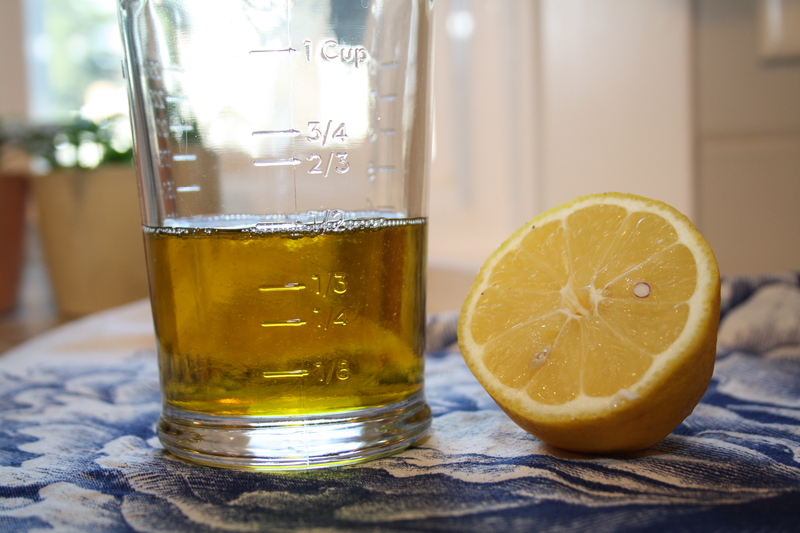 You can omit or substitute ingredients. It’s a meal in a bowl. It just works. For years, I didn’t really understand the beauty of the Cobb Salad. When I was growing up, Cobb Salad, Chef’s Salad, and Chopped Salad sounded awfully similar – therefore suspicious. It wasn’t until well into my 20s that my parents started making them, and in Marcus and my Sunday night dinners with them we finally got to give them a try. 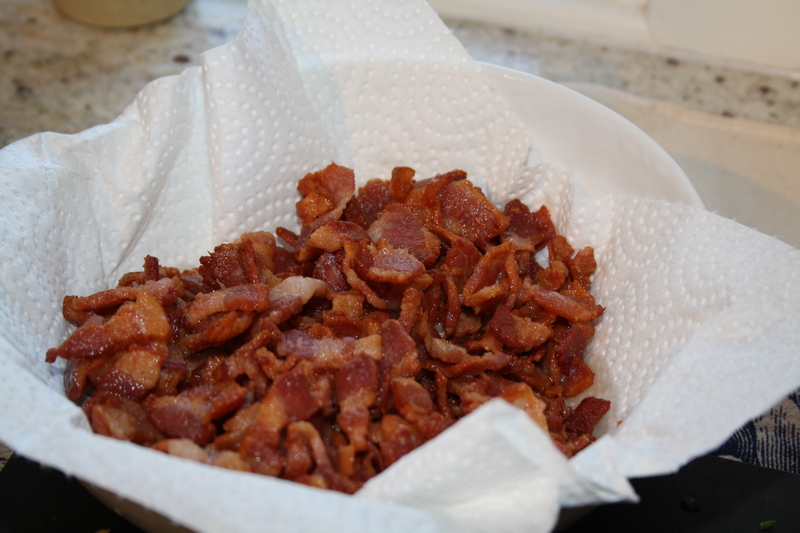 If you’re like me and don’t like cooking bacon, I usually do one of two things, depending on the intended end result. 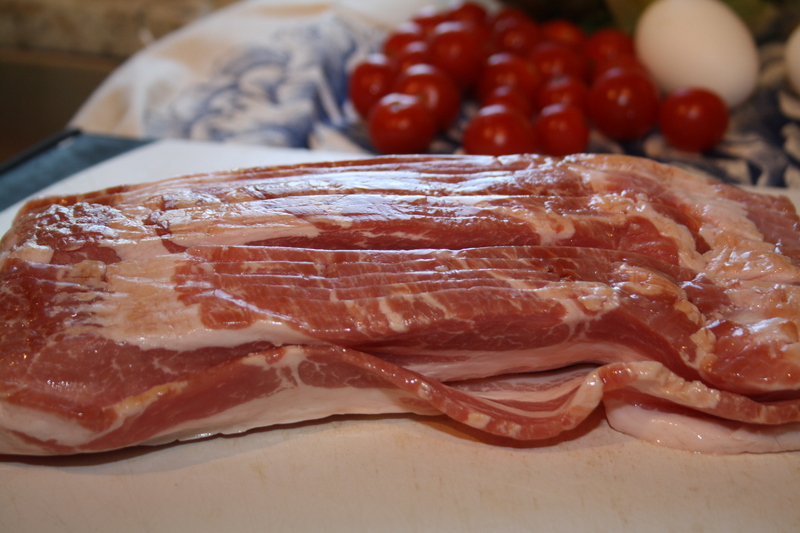 If I want the bacon strip to indeed be a strip, I’ll bake the bacon on a foil-lined tray in a hot oven. If I want the bacon to be in pieces, for say a frittata or pasta dish, I’ll slice it raw and cook it in a sauté pan with the lid on, stirring every once in a while. The grease splatter is greatly reduced, which is much appreciated in my kitchen. For blue cheese haters, I firstly say give it a try in this salad (Marcus gobbled it up and he “hates” the stuff). 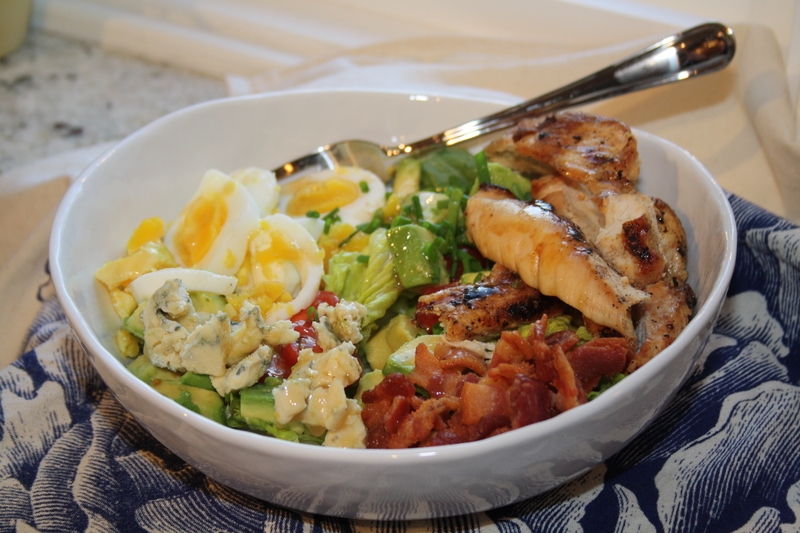 The smokiness of the chicken and bacon, creaminess of the avocado, and citrus in the vinaigrette is just begging for the tang of blue cheese. If you really, really can’t do it, we have substituted several different strong cheeses in its place; just pick your favourite one. Marcus and I are borderline obsessed with this salad. 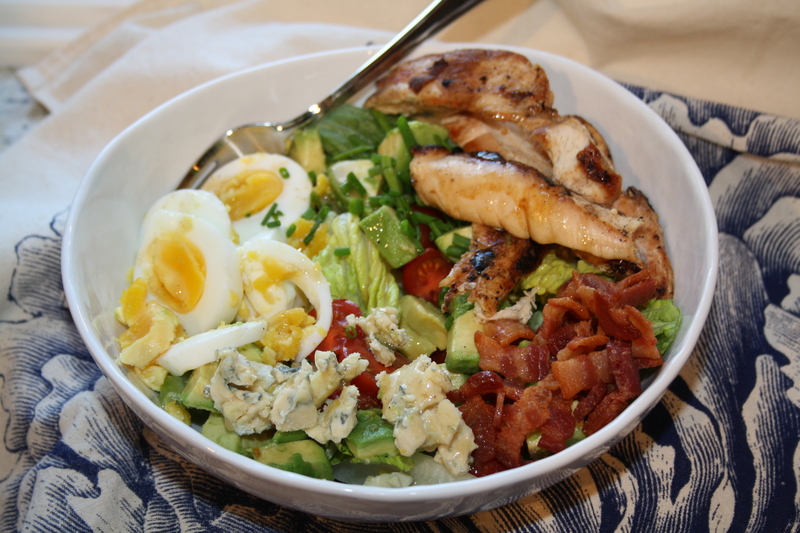 For a healthy weeknight dinner, Cobb Salad is so easy to prepare. Plus I have to admit, assembly, as opposed to cooking, can be relief after a long day. Here here, one-bowl meals! 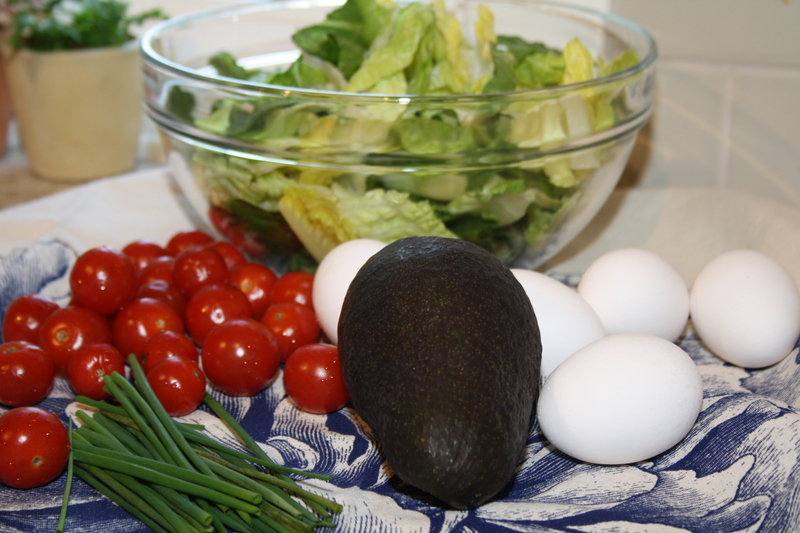 Arrange your salad fixin’s in bowls, or on a platter, so each person can easily build their own salad. 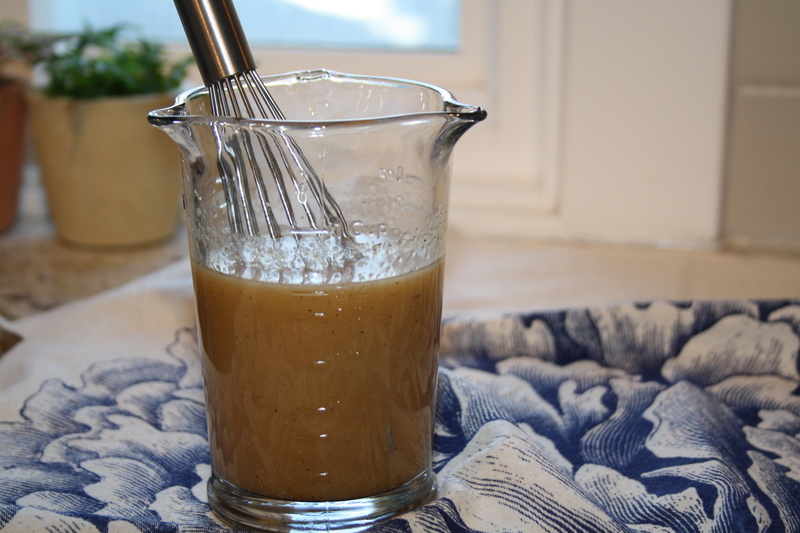 Make the vinaigrette by adding all ingredients into a small bowl and whisking until smooth.